While Rogue One director Gareth Edwards’ filmography is fairly short, it is impressive. He emerged on the scene with Monsters in 2010, then followed up with Godzilla in 2014. 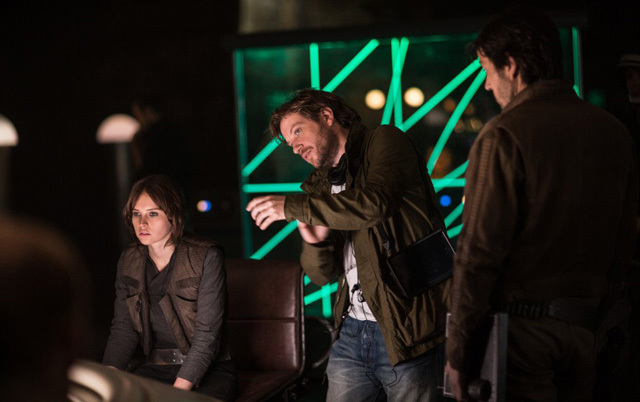 And while many other directors shied away from tackling Star Wars, Edwards stepped up to the challenge and took the reins on Rogue One: A Star Wars Story. Gareth comes across as reserved in videos and interviews, but the director is incredibly friendly in person. When I met him after screening footage from Rogue One at Skywalker Ranch, we chatted about my hometown of Houston, the fact that he shot Monsters in nearby Galveston, and his visit to the robotics lab at the Johnson Space Center. But hearing about his love of Star Wars makes you realize even more that Lucasfilm picked the right director for the job. A lifelong fan of the saga, he lights up when talking about Rogue One. You can’t help but be pulled into his enthusiasm for the movie and cheer him on as he unveils Rogue One to the public. In this video interview, I asked him about his biggest “geek out” moment, his love for the AT-AT, and what, if any, connections Rogue One may have with Episode VIII.